I have long held the belief that we are put here on earth to learn to love each other as God loves us. I also believe that in order to do so, we must look for God in each other. So it stands to reason, in my mind at least, that each and every personal encounter with each other can bring us closer to God, if we let it. If we are truly looking for God in each other, then it is not uncommon to recognize Him in our everyday conversations. 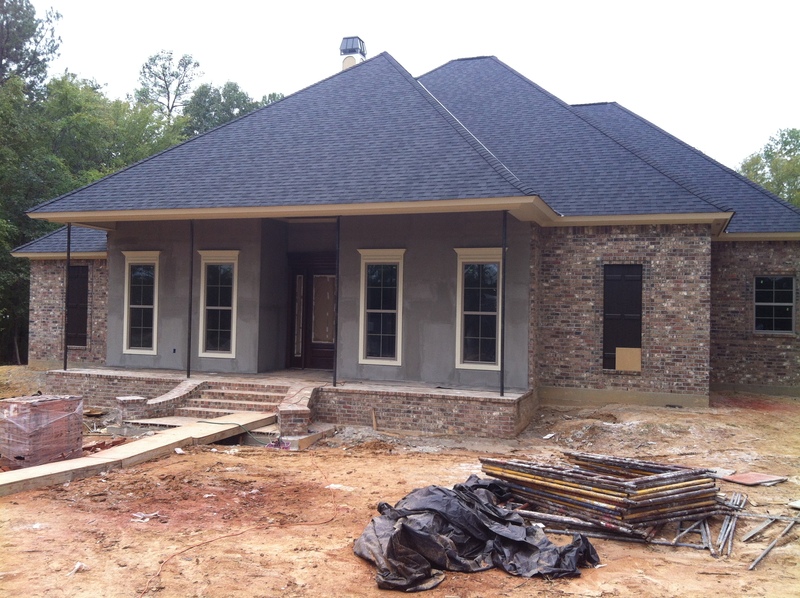 And so my beliefs and my attitude have been profoundly shaped recently through this process of building our house. I have earnestly tried to keep this house just a wee bit “above the earth” – as evidenced by the truckloads of dirt underneath it. (Just kidding…sort of.) When we began, it was a project. Something to do and dream about and plan. Then we broke ground and it became something to watch grow. We had waited sixteen years to build a house, while the dream floated somewhere in the back of our minds, waiting for the “perfect” timing. Living any day on this earth should prove to all of us that there is no such thing as “perfect timing,” so we finally, cautiously moved forward. As the frame went up, it became something to breathe God into. I feared that all that waiting and planning and dreaming would crash down around me if I put too much faith in and emphasis on the building itself. I had to keep my mind in the right place, my creative heart aimed at my own Creator, my hopes pinned to the promise that no matter what happens on this earth the next life is sweeter than I can possibly imagine. I etched his Word into the frame and the foundation, praying constantly that this earthly home will always point me toward my eternal home. And then the most amazing thing happened. This gorgeous house developed before my eyes. It’s far better than anything I could have planned on my own. Dom keeps giving me the credit. While I picked out fixtures and countertops and paint colors, I knew there was something more powerful at work here. I knew we were being blessed. And I knew we were first blessed with our builder. The thought of waiting until sometime in December frayed my nerves and bashed my plans. It took me more than a few moments to deal with it properly. What about Christmas decorations? What about Christmas parties? What about the tree and the lights and the hot cocoa in front of the fireplace??? WHAT ABOUT MY HOLIDAAAAAAAYYYYYY????!!! On a mostly subconscious level I have always known that this process really isn’t about me and Christmas lights. In slowly and begrudgingly letting go of my Christmas plans, I began to see Advent in a new light. This is our preparation and waiting period – we are waiting for something wonderful, something that fulfills a plan. And yet, even as big a part of my world as building this house is right now, it is nothing compared to the real meaning of Advent. The preparation of our hearts to receive God’s grace is far more important than the preparation for a Christmas party. I began to see a larger “God-moment” forming. As I reflected on my feelings of impatience I saw several parallels: my desire to move things along at a quicker pace paired with situations and plans that I did not know or understand; my disappointment over letting go of my own timeline and letting someone else “drive;” my slow and steady realization that I do not control everything in my world – nor should I. How many times have I made my own plans and then “life” got in the way – the building of moments that we so often take for granted? How many times has what I ended up with been so much more amazing than what I had originally planned for myself? How many times does my own Creator have to remind me to trust him? Through my own building experience, God has used Dominick to show me that what is in store for me is so much greater than what I can imagine or what I can plan on my own. Just as Dominick must take his time in making the house perfect for me and Dom, God takes His time in making us perfect for Him. It gives me a sense of peace to see Him working on me through other people. (And, admittedly, it’s a sort of permission to be so messed up.) Patience is crucial – and it comes relatively easy when we really let go and truly – once again – trust the builder. Rocky Horrors: Dammit, Granite! I Love You!!! As the granite guys were finishing up the install and smoothing out my seams, my builder – honestly unaware of my commitment to healthy, chemical-free living – casually commented to me that granite emits a carcinogenic gas. I looked at all my beautiful granite, which comprises every single countertop in my entire home, and wondered how in the heck I could have missed that news. Maybe because I never thought I’d be building a house and installing granite in the first place?? So, you KNOW I did some research, which included browsing through a 182-page document on foreign trade where I learned that Kazakhstan extended its ban on light oil imports until June of 2012 and Russia won’t allow pig imports because of some five-syllable disease potential. But, back to my granite and that nasty radon scandal. Turns out, most of this news came out in 2008, and there hasn’t been much ado about it since. So what was all the hype, anyway? Granite, being a naturally occurring material (stone) is going to naturally have some uranium, radon, etc in it. As do sand, concrete, clay, bricks, and rocks. As the radon is released, it can poison the air, and breathing it in excessive amounts could of course lead to cancer. Do not think that I take this lightly. But I’m also not going to take one source’s word for it. So I kept on digging, hoping to find anything written after 2008 that either proved or disproved all the accusations. Accusations, as it turns out, that can be traced back to people who have vested interest in companies that compete with granite countertop producers. Go figure. So where’s an honest mom to turn? I found this guy who broke it down and linked to some non-partial parties and offered some mind easing solutions for those of us who have a tendency to go off the rails when faced with news like this, especially as it might affect our health and our children’s safety. Basically, even though I have granite scattered throughout my home, I will face more danger from the radon in my brick and my foundation and my driveway than I will from my countertops. The good news is that as the radon (which is minimal) is released from these earthy substances, it dissipates into the air around us, so if our overall air quality is good, then our worries are nil. Granite that seems to produce the most radon and radiation comes from more exotic countries and usually is in the higher price ranges because of the cost of importing it. Additionally, the EPA suggests low-cost test kits for homeowners who are concerned about the radon exposure in granite countertops. So while I will completely wig out about hormone replicators in beauty products and petroleum by-products in our foods, I’m not going to sweat my countertops so much. My research and the lack of current arguments against granite pretty well convinces me that my bigger threats lie elsewhere, like that damn Halloween candy that just won’t go away. 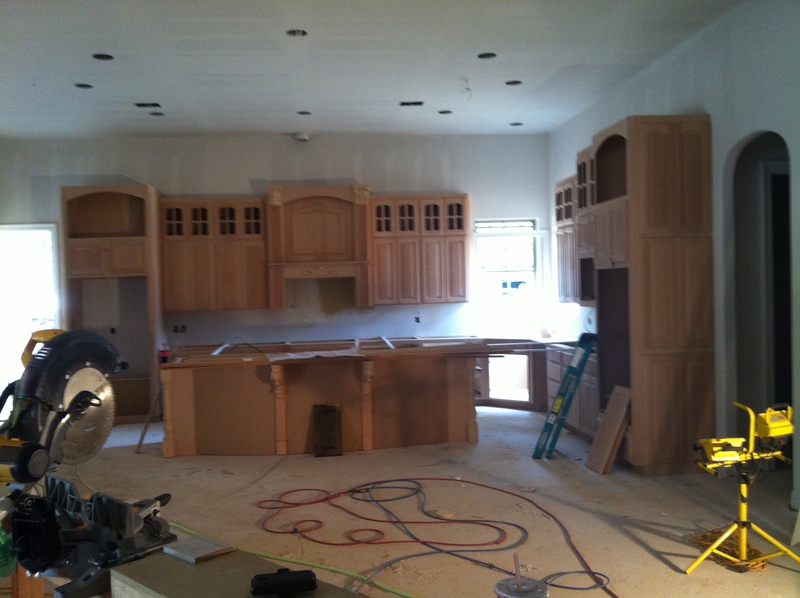 On the afternoon that the cabinets and built-ins were delivered, I was so excited. I ran through the house, snapping pictures of all the woodwork propped against walls and laying on the floors. 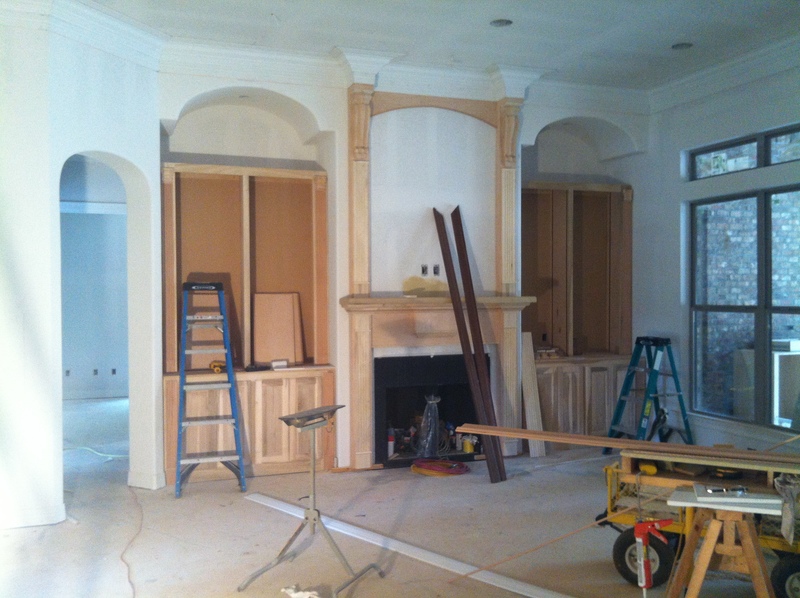 I beamed with pride as I identified my living room mantle and the utility room cabinetry. I skipped through the unfinished pieces and tried to imagine where everything was going to fit. The next morning, I was showing the photos to my mother on my phone. There was a photo of one of my living room bookcases propped on its side. It was then that I first noticed a vertical support beam down the center of my bookcase. “Hold on a minute! That’s not supposed to be there! It’s not that way on my plans! That middle bar is going to disrupt the flow of my shelves!!! !” I flung my massive sheets of house plans across mom’s kitchen table as I sought to prove myself right. “See?!!!! No center bar. They messed up! I gotta call Dominick! !” In my panicky state of mind, and on my itty-bitty phone, it actually looked like I would have all of twelve inches on either side of the center bar to display my bookshelf items. And twelve or so inches simply was not gonna do!!! I decided it was best not to call Dominick and tell him my dilemma, since I was already determined to drive out to the site and size it all up again. That way, I could show him exactly what I didn’t like about my bookshelves. And, with a small moment of clarity, I also knew that my builder is too much like me. Had I called him and said, “I’ll be there in 30 to talk about that center beam on the bookcase,” he would have stewed and worried until I arrived, at which point we would have both been so frazzled that we would have been absolutely no good to each other. Instead, I dropped Vic off at school and headed south to my new home site unannounced. Here’s a little kitchen preview while we wait for the painters to come in and stain all these cabinets that I can’t reach. Unbeknownst to me, Southern Antique is smaller than the average 9” brick; it is closer to 7”, I think. That’s potentially one of the reasons that we had to order so much more as the bricking went on. Combined with a few other significant factors, like my last minute patio fireplace and such, it caused my builder to have several more squares/pallets/whatever-you-call-them brought in. I took it all in stride because it looks So. Freakin’. Awesome. 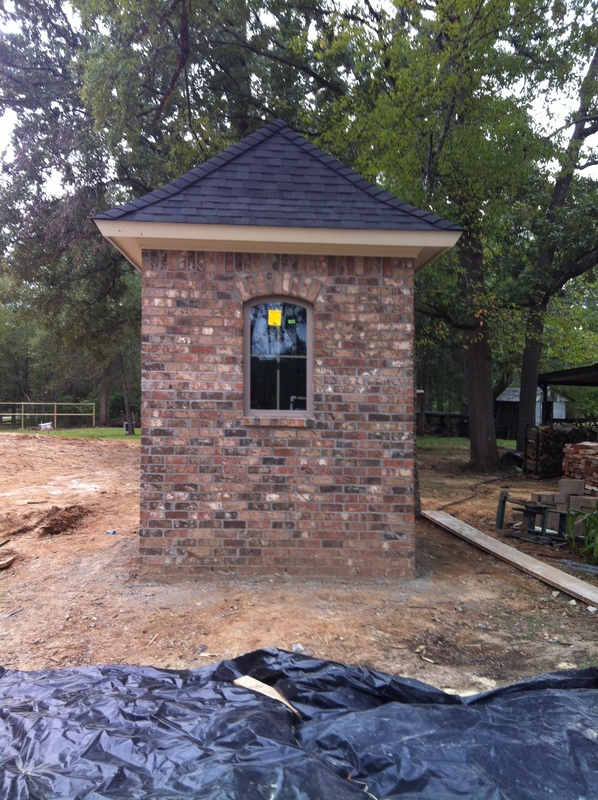 And our well house…which looks like a guard booth…which makes us giggle. Dad says all we need now is the “AK.” I love my well house! 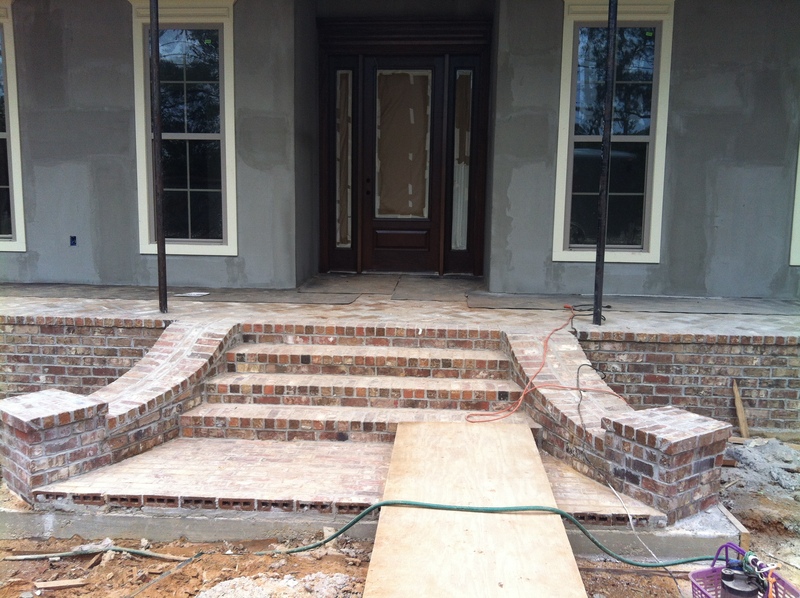 One of the things I knew early on that would cost me more was that I wanted steps leading up to the front door. The estimated cost was totally worth it, to me, despite the fact that we had to build up the land so much with all that “good dirt.” (As my luck would have it, my lot slopes perfectly… in the wrong direction.) I couldn’t wait to see what the steps would look like. In my imagination they were modest and cute. In reality, they rock the earth off its axis. 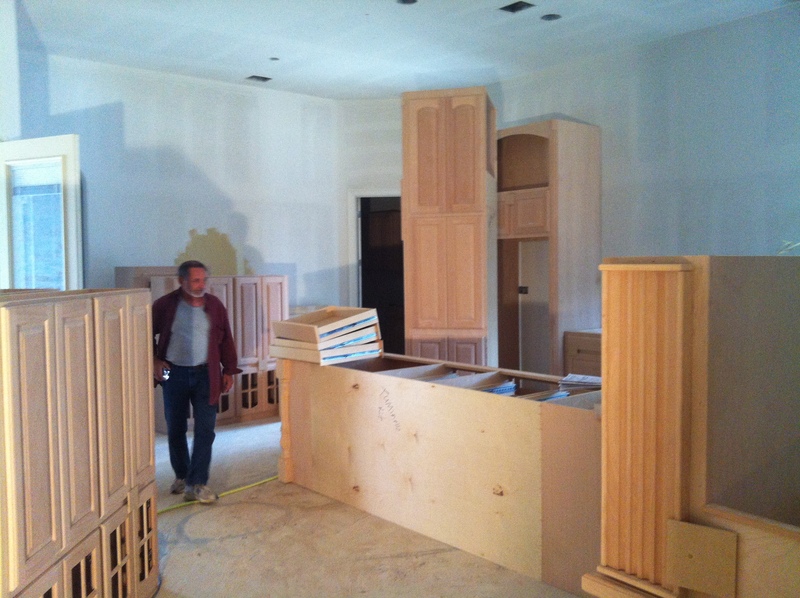 I am realizing more and more that my builder, Dominick, is not like any other builder. He is on the job site almost every working minute of every day – even on the weekends when the crews are available to work. If something is going on at my house, he’s there to supervise. If there is any work that he can do himself, he does it. (He and my Father-in-law built my shutters so I wouldn’t have to buy over-priced ones!) When it was time to build the steps, Dominick was right up in there. He didn’t like the way the curvature of the side brick was going, and he made the brick masons rip it out and start over…twice. One of the men called him a name in Spanish, not realizing that Dominick knew what it meant. (In contrast, my Dom only knows the Italian curse words!) Dominick stopped the brick masons and said, “Let me ask you something. If I were building a house for you, how would you want me to be?” They admitted that if he were acting on their behalf, they’d want him to be just the way he is – making certain that the work performed is superior to any other. 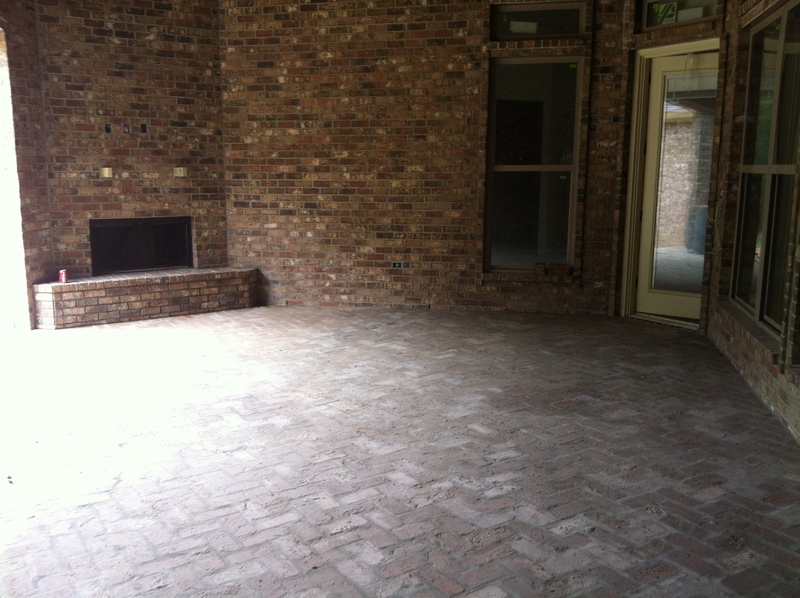 About three weeks ago Dominick asked if we wanted to brick our patios – as in, the floor of our patios. Dom and I considered all the alternatives, including the option to leave them all plain gray concrete, before deciding that oh-heck-yeah! we wanted to brick them all. But, my house brick is not solid, as brick on the flooring must be. So I needed something like Old Chicago brick. Unfortunately, all the OC that I had ever seen was…ahem…orange, and that simply was not gonna work for me. One day after a meeting with my builder and the cabinet man I drove myself back to the brick company to pick out a complimentary brick for the patio floors. I got lost on the way to the brick shop, but didn’t sweat it much – I had an iced caramel latte to keep me company. 😉 As I made my way back to the main road, I wound through a neighborhood where most of my high school friends had grown up. I recognized street names and was overwhelmed by the Mayberry feeling I got as the kids and moms flooded the sidewalks after school let out. It made me realize what my kids miss out on by not attending a neighborhood school. And it made me a bit misty for the kids who walked those same sidewalks thirty years ago, and who I will never see again. 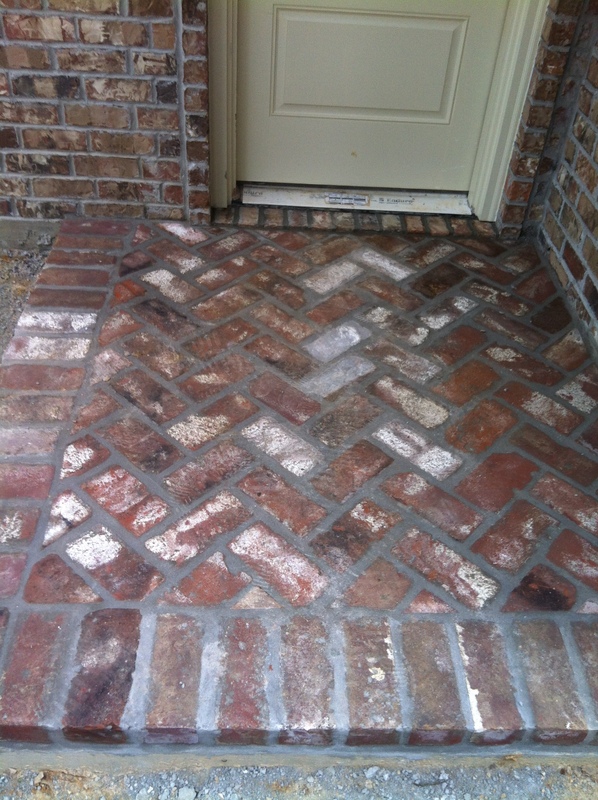 The slow, meandering path I took to the brick company actually did my heart good. When I got to the brick store the employees were waiting for me, and a really nice man showed me my three options. Ironically, the Old Chicago brick is running more taupe these days, but it was actually too close to my wall brick color to give me the contrast that I wanted. The next sample was a bit more red, and the third sample was plain ol’ brown. (Guess which one I didn’t like?) I went back to the red, named Carolina, and within two minutes the gentleman was writing down my choice and assuring me that he thought it would look beautiful. Ya know what? He was right! As for the inside of the house, all the sheetrock has been floated, taped and textured. My builder is sweeping up the remnants of drywall dust and nails, clearing the area for the trim carpenters and cabinet installers. (Told ya he does it all!) And I’m headed to the tile company to make sure I still like what I picked out six months ago. I imagine that we will be moving in sometime in November, and I absolutely cannot wait! Meet Lady. 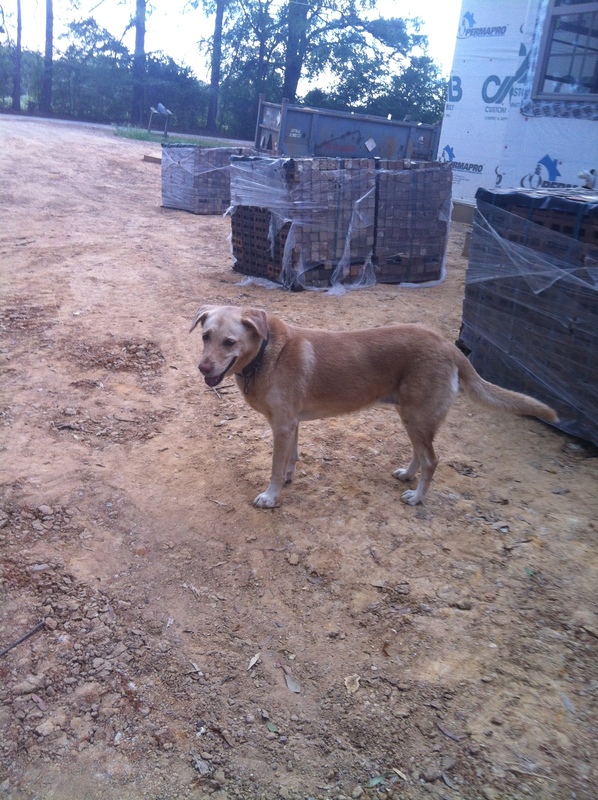 She is my father-in-law’s dog, a sweet Yellow Lab. She goes everywhere Dad goes. And she rarely will go anywhere without him. 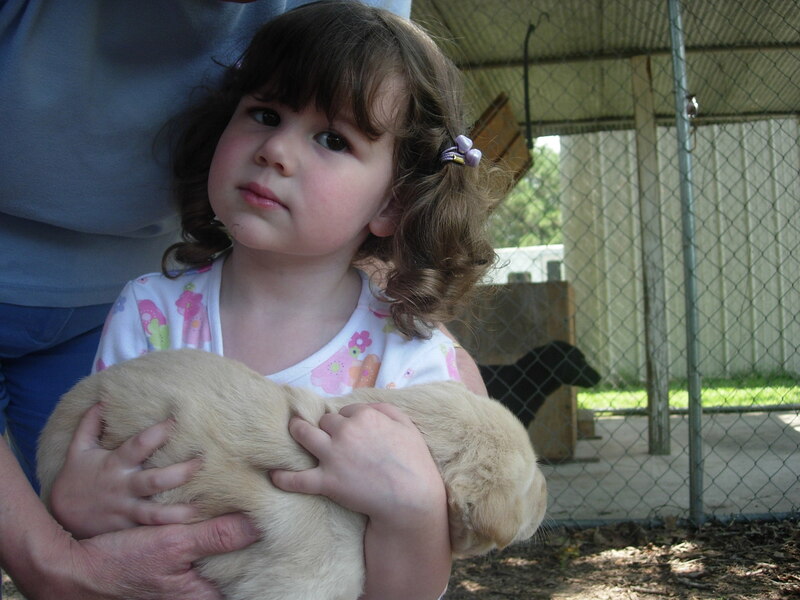 We went with Mom, Dad and a few of the grandkids to pick Lady out of a litter 7 years ago. Truth be told, I think they let the kids pick the pup. 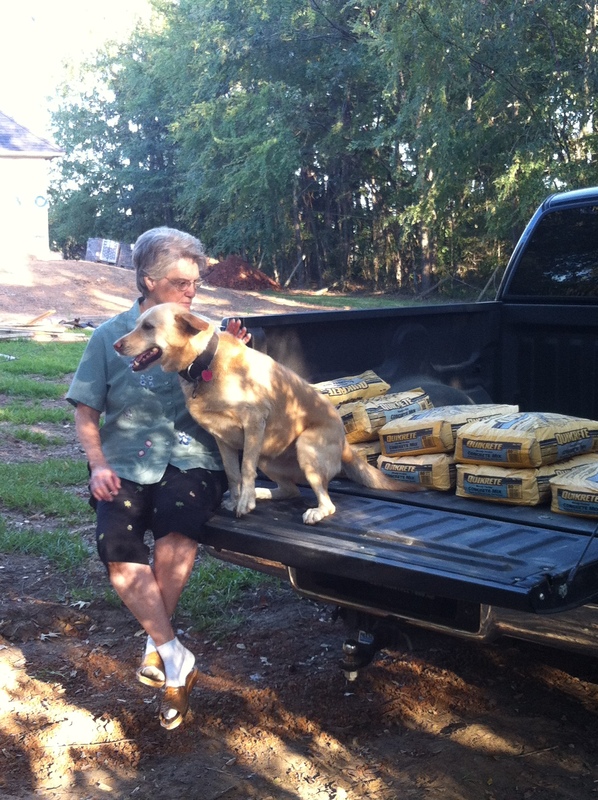 This is one of my favorite pics of Vic, taken on the day Dad got Lady. 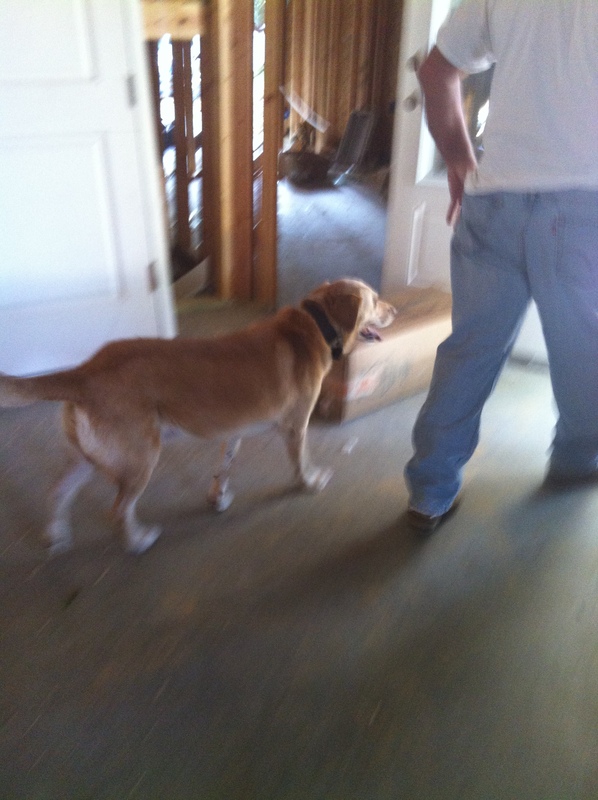 Lady visits the new house next door whenever Dad walks over, provided he has given her permission to follow. (Think any of her good behavior will rub off on Mabel when we move in?) She sweetly follows, keeping Dad in her sight at all times. 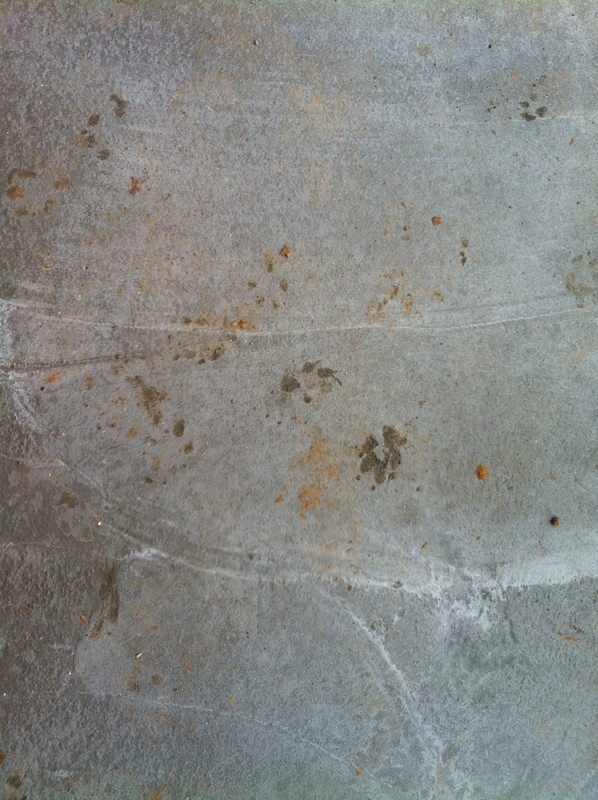 When the pad for my front steps was poured last week, Lady autographed the cement for us. 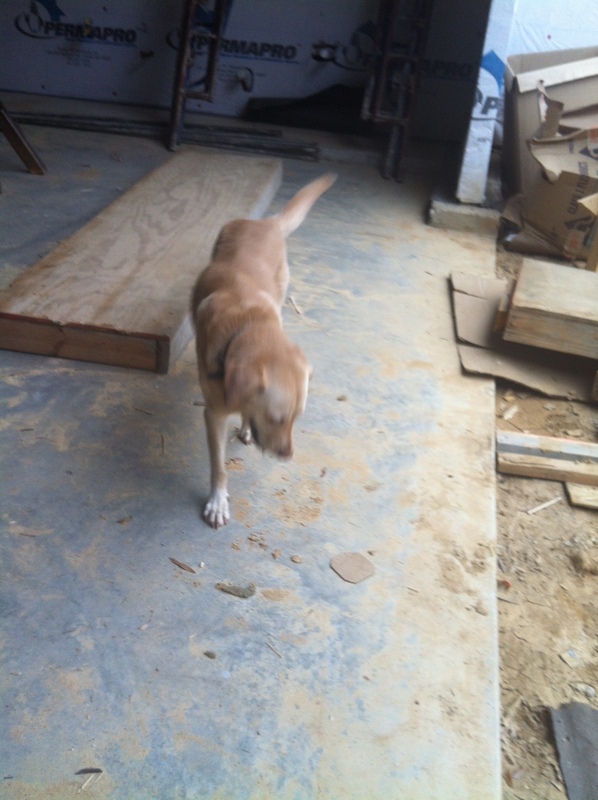 She has become quite the inspector of the new homestead, sniffing the cement and greeting everyone who comes to work. I think she is as satisfied with the progress as we are. I also believe she will make an excellent neighbor! 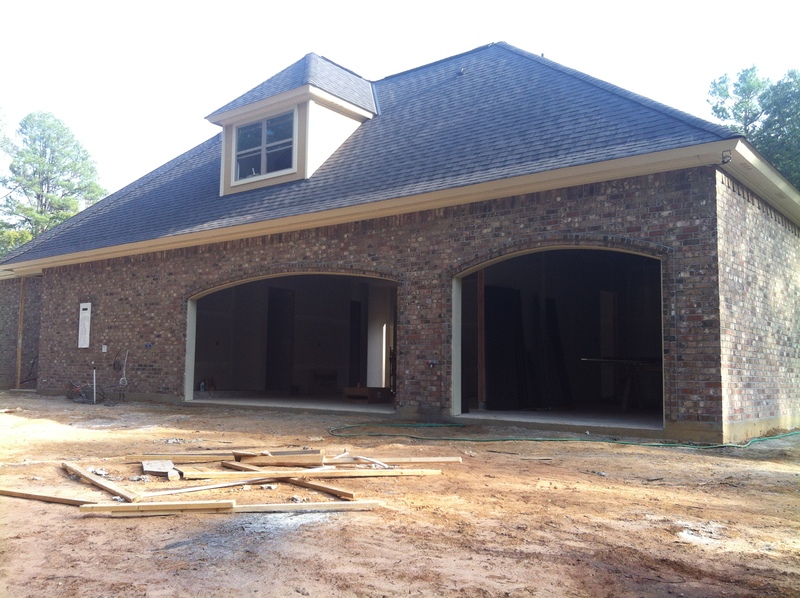 It’s been a little while since I gave a full-fledged update on the new house. I don’t think there has yet been a single development that hasn’t thrilled me to my very core. 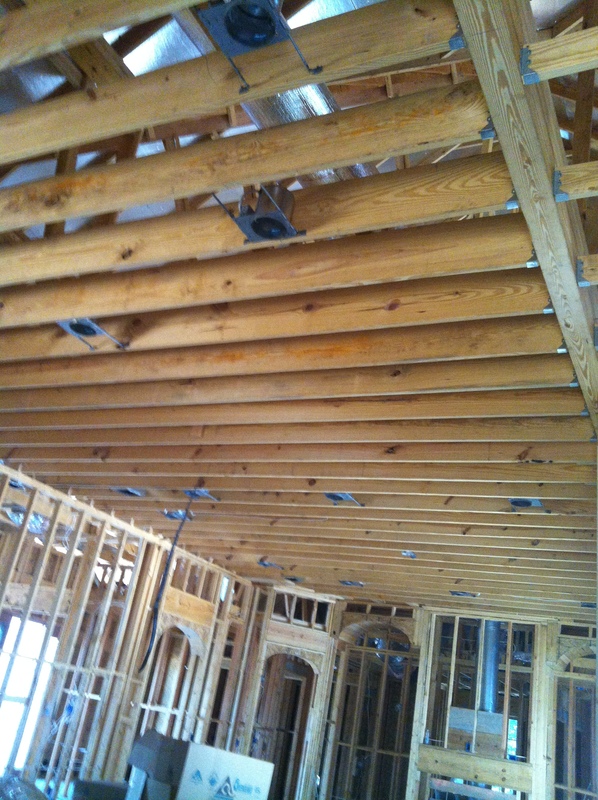 As the frame went up and the rafters were positioned, the home started taking incredible shape right before our eyes. Some insulated boards, a little home wrap and a bit of tar paper gave the structure some Little-Engine-That-Could character. In the midst of the raftering and the structuring, I loved walking through the house and memorizing its bones. 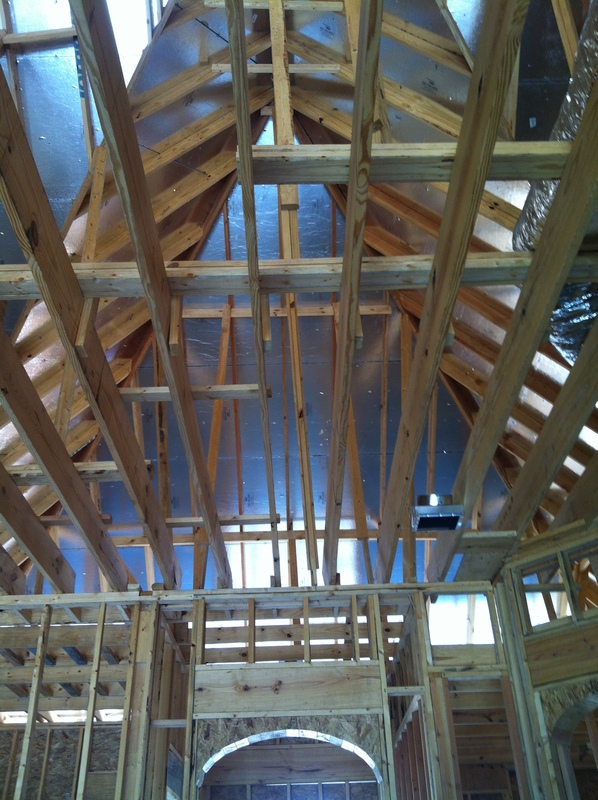 I know it will look completely different when the sheetrock goes in, but for now I love looking up through my ceiling area and seeing the intricacies of the rafters. (Hey – it’s intricate to me. I can’t manage to fasten two popsicle sticks together on my own.) My favorite part of the bones is this portion of the roof’s underbelly as seen over the entry hall from my living room. It reminds me of a cathedral, and when the evening sun peeks in and reflects off of the insulated boards it looks downright ethereal to me. Electricians came in and did their thing, giving my rooms and ceilings a little more character with the lighting hardware. 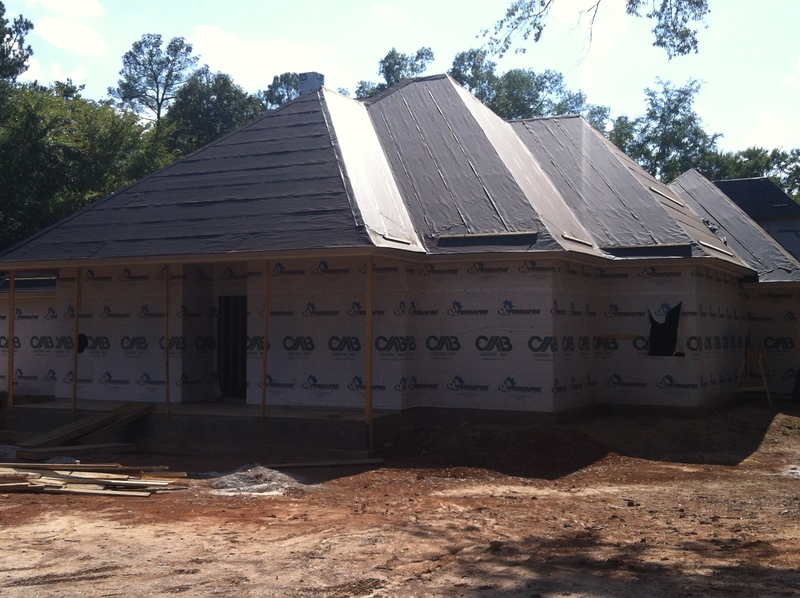 Tropical Storm/Hurricane Isaac threatened Louisiana right as we were preparing for shingles to go up. 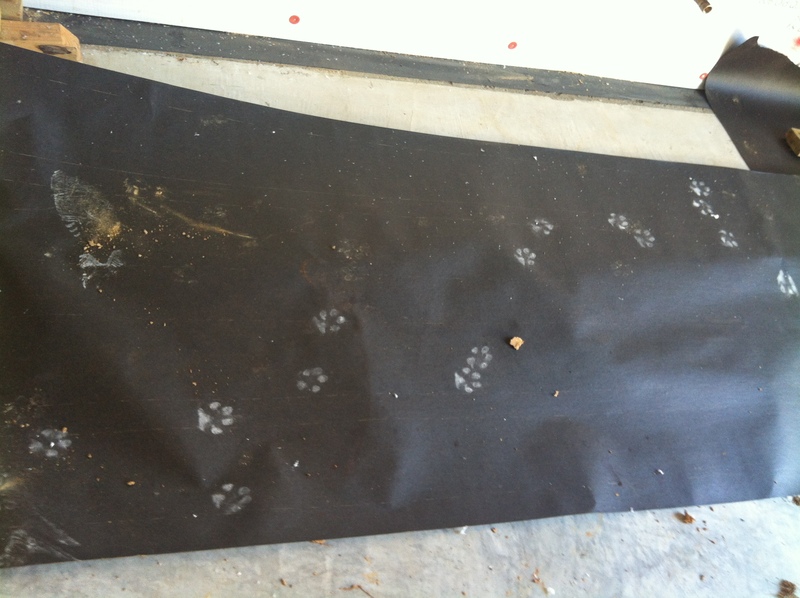 Given that my home sits on good ol’ down-home Louisiana red clay, my builder was very cautious about letting anyone up on my roof with mud on their shoes. 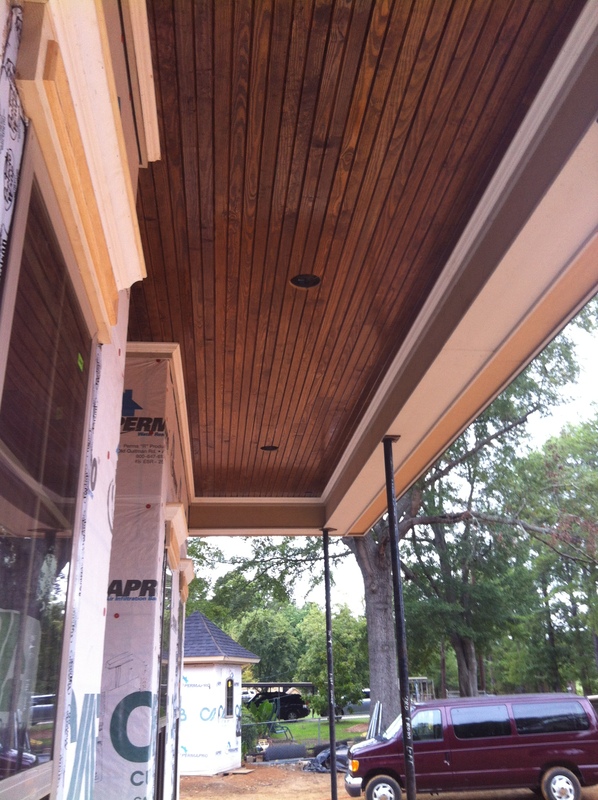 The threat of bad weather meant we waited a few extra days before the shingles were added. If you ask me, it was totally worth the wait. So you see, things are definitely “looking up.” We’ll be plugging along until the next update. 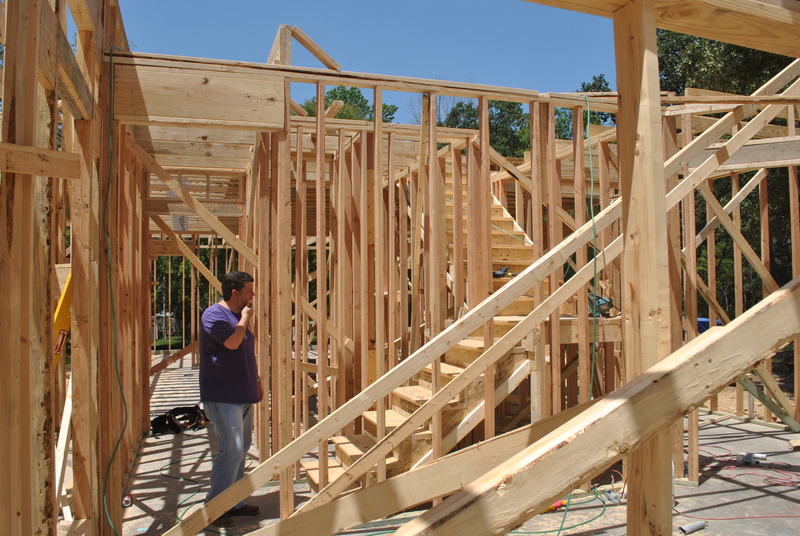 This week the official framing of the house began. Now we can start to see slight room definition. While placement of the rooms is now clear, relational size of them still eludes us. But that’s okay – we got us some sticks!! One afternoon I drove out to the site via a different access road. 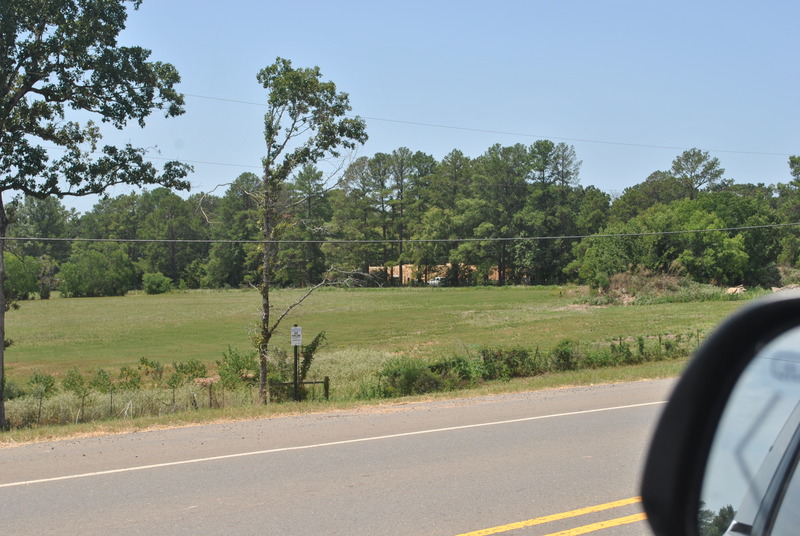 As I drove over the interstate overpass I glanced in the general direction of my house. All I could see were trees and studs. I mean, I could really see my not-even-half-constructed house through all those trees!! My hand flew to my mouth and I think I actually said, “Holy crap! That’s my house!” Out loud. It just looked so…big. Someone please remind me of that if I ever whine about how small it is. Or better yet, just give me a good ol’ Gibbs head slap. I’ll totally deserve it. It all feels so very real now. The dream is starting to take some actual physical shape. We even have stairs already!! 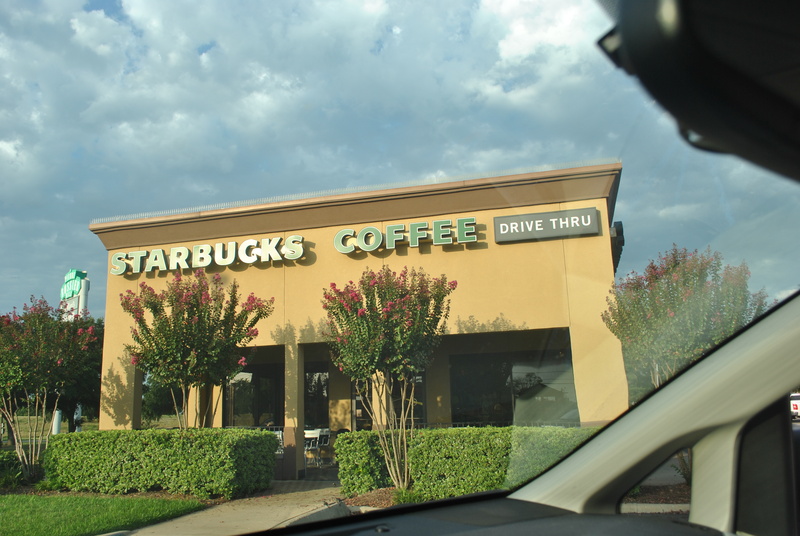 Anyhoo, I was happily riding along in the passenger seat of my Dad’s car when we pulled into a Starbucks location that I had all but forgotten. While sitting in the drive-thru it finally hit me: I LOVE the color of the building. It’s a dark latte color, or maybe a…mocha frap? I emailed Starbucks’ corporate offices to ask them if they could possibly research their files and tell me what color was used on that particular building because I wanted to duplicate it on my house. They kindly replied that they could NOT tell me the color because it would violate the confidentiality agreements they have with their contractors. I assured them that I am not above standing outside the coffee-house with a stack of Sherwin Williams paint swatches – which I have already done (twice). But thanks to a Starbucks-loving Sherwin Williams employee and another who thought the confidentiality excuse was a load of bull, I was able to learn that the exact color is SW7695, Mesa Tan. We finally have visible evidence that we are really going to do this! The dozers arrived at our lot on Friday. This morning they cranked up to take down one of the large oak trees I had hoped to keep but finally resigned myself to live without. There are two large older-than-dirt oaks at the front of the property and I had envisioned them quaintly framing the front of my house, Spanish moss dripping from their crooked branches. And then we went to the lot to stake out the foundation last weekend and I got to really looking at the two oaks. The smaller (though not by much) tree would need a lot of trimming if it were going to carry a particular look – and not drag across my roof. I decided then that if I had to give it up, I would try to not be heartbroken over it. As it turns out the tree will actually be too close for comfort to our foundation. Our builder tossed me some ideas to keep from losing the tree, like pushing the house back on the lot, etc. He knew I really wanted both trees. In the end it would have meant more materials to accommodate a longer driveway, which translates to more cost, not to mention a shortened back yard. 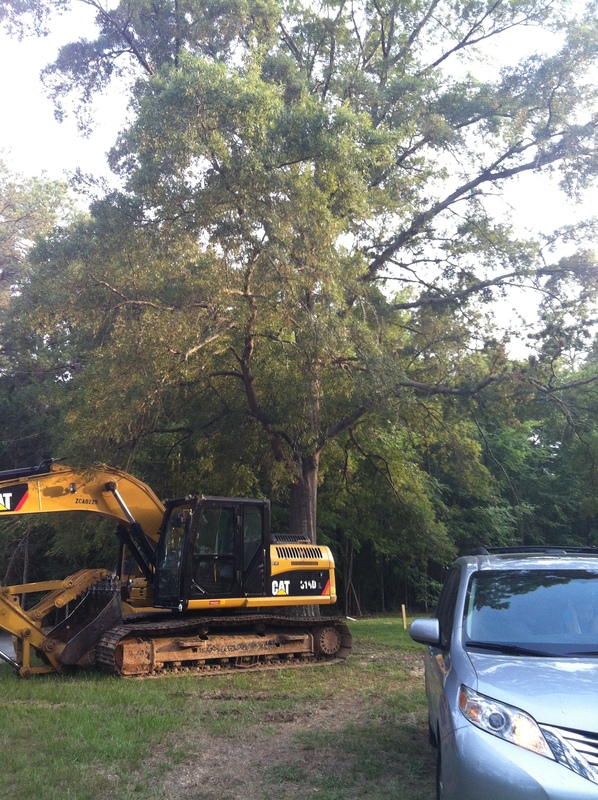 I declined any edits to our plans and said my mental good-bye to the stately oak.